Jesus was a badass. Or at least, that’s what a growing flock of enterprising evangelicals is bleating. Spooked by the massive exodus of young men from their ranks, a growing number of nondenominational churches are setting up fight clubs in a bid to keep their testosterone in-house. Mixed martial arts (MMA) clubs are cropping up in churches all over the country. The New York Times uses the estimate of clergy in the know, saying that about 700 of an estimated 115,000 white evangelical churches in the United States, are taking up mixed martial arts and the sport is accepted as a real proselytizing tool by the National Association of Evangelicals. The stratospheric popularity of mixed martial arts is one of the most dramatic trends in popular culture. Just a decade ago, mixed marital arts were banned in most states and demonized by politicians like John McCain as a dangerous bloodsport. The sport has taken off in the last five years through savvy marketing by Ultimate Fighting Championship (UFC), the sport’s main promotion company. It is now legal and wildly popular in most states. The goal with this kind of language is to give Christianity a face-lift and convince young men that church isn’t just for women: “some ministers… fear that their churches have become too feminized, promoting kindness and compassion at the expense of strength and responsibility,” says a February 1 New York Times article. “‘Win or lose, we represent Jesus,’ he said. ‘And we win most of the time'” Paul Burress, 35, a chaplain and fight coach at Victory Baptist Church in Rochester. We are not pussies dammit. As if Christianity were not sexist enough already. The main purveyor of socialized sexism has just been injected with another dose of testosterone. Jesus was a badass. Or at least, that’s what a flock of enterprising evangelicals is bleating. Spooked by the massive exodus of young men from their ranks, a growing number of nondenominational churches are setting up fight clubs in a bid to keep their testosterone in-house. Mixed martial arts (MMA) clubs are cropping up in churches all over the country. About 700 of an estimated 115,000 white evangelical churches in the United States, are taking up MMA and the sport is accepted as a real proselytizing tool by the National Association of Evangelicals. The stratospheric popularity of MMA is one of the most dramatic trends in popular culture. Just a decade ago, it was banned in most states and demonized by politicians like John McCain as a dangerous bloodsport. But MMA has taken off in the last five years through savvy marketing by Ultimate Fighting Championship (UFC), the sport’s main promotion company. It is now legal and wildly popular in most states. And little boys are the last thing evangelicals want leading them into the rapture. Hellbent on not letting their young men be left behind, the charismatic band of believers is building a jihad-like army of Anointed Fighters. The message is clear: Why step out into the world if you can bash face right in church? These guys don’t tap. This would be an exercise in turning the other cheek. I’ve been to a big non-denominational evangelical church, and they do use a lot of marketing ploys: coffee shop, rock band, comedy act – the only thing left out on Sunday morning was real worship. The idea of fighting in church is a new one on me, though the idea of re-emphasizing the strong, masculine aspects of religion isn’t. A few years back I read a really good book, “Wild at Heart”, by John Elderedge, that addressed the issue of the so-called feminization of church and how men were created by God to men so it doesn’t have to conflict with Christianity. His premise was that God created men to be adventurous, to be fighters, and to be a little wild; and that God is that way too. I don’t think Elderedge recommended starting fights in church, though. His idea of fighting for what you believe was more of a spiritual battle (as it is in the Bible). But he did encourage men to be physically active and a little dangerous. I think this is more than just a marketing ploy, Elderedge touches on some good truths. The Bible itself calls us to be strong and courageous, to fight the good fight, to finish the race. There are repeated analogies drawn up between the Christian life and the battlefield. So while it’s certainly not wrong that we as Christians are told to be kind and compassionate and to “turn the other cheek”, we also shouldn’t forget there are right ways to fight. Actually I think the message of the Church to men needs to emphasize that “turning the other cheek” doesn’t mean giving up, it actually is a form of doing battle – because victory doesn’t come by knocking the other guy out, but by winning his soul. And surrender really takes more courage and strength than fighting in the traditional sense. God doesn’t call us to be whimps, He calls us to a deeper, more potent kind of strength. “Anointed Fighters” is almost as disturbing as “Left Behind: Eternal Forces” (http://www.eternalforces.com), the “Convert or Die” video game, reviewed in the SF Gate back in 2006 (http://tinyurl.com/yhzu6sl). Agreed. I think faith at its core has the strength to do this. Threatening people with bodily harm in order to get them to convert seems like a separate tactic from using martial arts classes in order to attract people to church. Did I miss the connection? Jesus didn’t tap sounds more like a cheesy marketing campaign rather than a dangerous foreshadowing or forced conversions. Or are we just concerned that a more martial emphasis for Christianity would ultimately lead to that? (Maybe possible, but it seems like a bit of a stretch. I’m more concerned with the way that Christians – both the Left and Right – seem increasingly to be turning to the government to push their agenda). Why do you see Christian video games having crossover appeal and a place in mainstream gaming? History tells us there is. Christian music has experienced tremendous growth, as have Christian themed movies including The Passion of the Christ & Chronicles of Narnia. As high-quality Christian themed video games come to market, the same American buying audience is expected to continue to be interested in inspirational entertainment. Interesting. It seems a church will use anything to draw people in, like MMA speak claiming “it’s what Jesus would do!” Jesus did walk the earth and show us what he would do. I can appreciate marketing strategy and if the goal is to retain or draw more young men into the congregation it’s probably a good grab, though I feel it has actually very little to do with a Christian walk. “The word ‘marketing’ and ‘church’ in the same sentence makes me sick”. this is such a desperate move by evangelicals. Is there any wonder people aren’t interested in the real Jesus? Well, it certainly is creative marketing. Whether or not it is consistent with Christian values is up for debate. I don’t personally have a problem with the concept of MMA. Some of the extremes can be curbed. It certainly is an effective connecting point for young men. Good to see you on CultureMutt Sam! Why does church marketing make you sick? Good marketing boils down to effective, true story-telling. Every church does it and there is nothing inherently wrong with it. Even the real Jesus indulged in it. The question with MMA is about whether or not there is a values-based discrepancy between the sport and churches. I have no problem with it. There are all sorts of micro-ministries. Anyone who thinks that MMA is inherently anti-Christian doesn’t know what they are talking about. I do take exception to the use of ‘white evangelical churches’ though. I don’t know why they insist on using that term. There is no such thing is a white church. I have never been to one. I have, on the other hand, been to Hispanic, various Asian, and black churches. The so called ‘white churches’ are always by far the most diverse. The media pulls this crap all the time. Saying that people at tea parties are all white, like that somehow discredits the movement. It is off the subject, but it is stupid. I may as well say, oh those pro-immigration marches, that was just a bunch of lazy Mexicans trying to get out of a day of work. Any time they use the phrase ‘mostly white’ it is a code for ‘a bunch of racist rednecks’. At least, that is my take on it. Back to the subject, the churches need to do more of this kind of thing. It gets people in the door and it helps build community (which is one of the main points of having a church). Unhappy about Meghan McCain’s view on Tea Parties? I really do not like Meghan McCain. She is a fatter and slightly more intelligent Paris Hilton. Well, to be slightly more substantive than calling her fat, her comments on the Tea Party people were inaccurate. One, she tried to project a statement of one man on to the entire Tea Party. Stupid at best. It is a ridiculous broad based judgment that would never fly for the other demographic communities. You couldn’t make such a broad based assumption about immigrants, gays, blacks, women, then why the Tea Party people? So, in the same breath of her calling Palin a hypocrite, she makes a hypocritical statement. Also, she said revolutions don’t start with old people, but with young people. The American Revolution comes to mind. John Adams, George Washington, Thomas Jefferson (mid 30s which was middle age back then), and Ben Franklin (70) were all old men at the start of the most successful revolution of all time. oh my goodness, this is so weird, I had heard of this before but didn’t know it had grown so much. The whole “anointed fighters” thing scares me a little because I wonder if there is something much more deeper going on by establishing these fight clubs. I have already met many angry Christians in my lifetime who say that in the old testament God approved of fights and wars and even commanded others to kill and sadly many people who think like this, have turned off tons of other people who think Christians are psycho and are the meanest people they’ve met. I happen to think that Jesus was a peacemaker and actually it takes more guts and more “manliness” to choose peace in certain situations. Jesus said: “Do not suppose that I have come to bring peace to the earth. I did not come to bring peace, but a sword.” (Matthew 10:34) Jesus was a warrior! On the other hand he also said “All who draw the sword will die by the sword” (Matthew 26:52), and “But I tell you, Do not resist an evil person. If someone strikes you on the right cheek, turn to him the other also.” (Matthew 5:39). And those are all in the same Gospel! The sword Jesus came to bring is the violent reaction of the world against those of us who choose to reject it and follow the Messiah’s Truth, not a crusading blade to smite the wicked (that will come later, though – see Revelation 19:21). When Jesus was here he set the example for us by doing battle in a very different way. Clara hit on the main point: ‘it takes more guts and more “manliness” to choose peace in certain situations’. Turning the other cheek is much harder than hitting back. I think we need to emphasize more, though, that turning the other cheek is not a surrender, but a better way to fight. 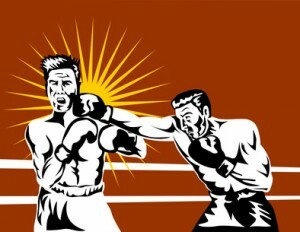 As far as fight clubs in church goes, I don’t see it as necessarily positive or negative. If it gets people in the door, that’s good, but only if there is a real substantive message in that church. It can be negative, though if it gets young men in the habit of thinking of fighting only in the world’s terms and not in Jesus’ terms. That’s where you get scary ideas like crusaders and jihadists using violence to defend their faiths. Interesting points Clara. So where does the God of the Old Testament fit in with His mandated genocides? Micah… cleaning out the temple with a whip hardly sounds non-violent… there seems to be a role for positive aggression in Christian thought. I agree Jesus was gangsta. But I smile when I think of white evangelical churches encouraging sweaty half naked young men to lock their bodies in an aggressive embrace. How interesting. I’d never heard MMA in churches. The lust for violence reveals a serious character flaw in those who have it. It’s not something that belongs in church. Real men aren’t knuckle dragging savages. They are able to dominate themselves and all impulses and urges. Christianity may have become too tame, but it’s because we’ve given up on being counter-cultural and actually practicing what we preach. Radical Christianity is not being like everyone else, only wearing a cross while doing it. Radical Christianity is feeding the hungry, visiting the sick, and putting your desires and lusts aside for the sake of a higher, more meaningful existence. And what do you think? Approve? Excellent thoughts Jonathan. But claiming that MMA clubs betray a lust for violence is a bit of a leap. Weren’t a lot of OT protagonist heroes trained fighters? Much of the training in MMA is precisely concerned with dominating your impulses/urges… being countercultural may be a positive thing when the prevailing culture is wrong but peculiar for the sake of being peculiar is simply irrelevant.